"He just needs a little plaster." I love a guy with chiselled features. Who is this man?- No one nose. It's a little know fact that cocaine was in fact very popular in Roman times. "Friends, Romans, countrymen, lend me your nose." His nose is definitely eRodin. "That bloody night watchman still hasn't been to Specsavers." I told the Sculptor to use a fine chisel but he had to Pick it..
"Yes. My husband is a lot older than yours but he doesn't smell". "Whose it meant to be and how come it's damaged?" David sphinx to himself, "Hold on, I'm totally not the first statue to rock this look..."
"Forget it, Caesar. It's Egypt-town." A stony stare, chiseled features, and a granite jaw ... shame about his busted nose.
" 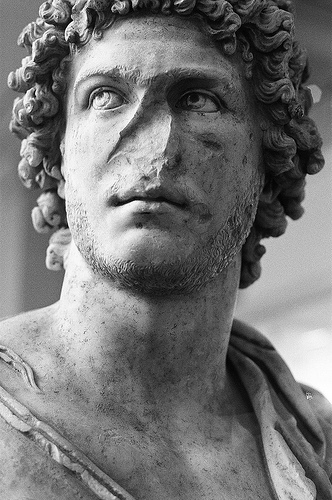 This is a statue of Catchalot, The Roman God of fishmongers who lost his nose to a Moray Eel"
Looks like Alexander the Great did die of syphilis after all. "No, I've never told a lie in my life."